So many hot days ahead means a lot less cooking indoors at my home. During the summer I like to make sandwiches and BBQ outdoors. One of my favorite sandwiches is a BLTA. Nope, that is not a typo. I love making bacon, lettuce, tomato and avocado sandwiches. The avocado is a great substitute for mayo and adds a creamy touch. To enter, just comment with the type of sandwich you would make with this great kit! 3 Winners chosen on June 30th! You can order your own sandwich kit with a 25% discount. Just use code "DADWICH". Disclosure: I received the above listed kit for review. All prizes are provided by Goodcook.com. I love BLTs! I also love turkey or chicken sandwiches with bacon. My favorite sandwich though is hot pepper jack cheese with lots of veggies- onion, tomato, lettuce or sprouts with mayo and mustard! I would make a roast beef, provolone cheese, lettuce, tomato, avocado sandwich with a little honey mustard with this sandwich making kit! Yum I would probably make a deluxe grilled cheese with avacado and ham, with a couple of different cheeses. I'm a sucker for tuna on some crusty bread. I'd definitely start with that and add lots of yummy veggies. Tuna salad with broccoli slaw toasted with provolone on a ciabatta roll! I would make a BL with mayo...Allergic to raw tomatoes so I just leave them off my sandwich. A ham and swiss would be great too! I would make a grilled white cheddar and bacon sandwich. I would probably make a grilled ham and cheddar sandwich. I have a family that nobody likes the same thing, Therefore cheese would be for a grilled cheese for my son, my grandaughter only likes bacon, I love BLT's, hubby would make roast beef. I'd make a nutella marshmallow fluff sandwich, but I won't tell anyone else about it since that's my poison. I would make a classic club sandwich, yummy! I would make a ham and turkey club sandwich or a Fried Bologna and Egg sandwich. I would love to make a ham with provolone cheese sandwich. I would make my favorite corned beef, pastrami and swiss cheese on rye. I would make a turkey, cheese, onion, tomato, and spinach sandwich. I would make a turkey, bacon, tomato and cheese sandwich with mayo! 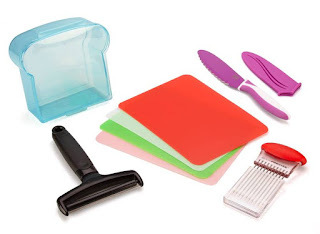 Cute sandwich making kit. I would make a tunafish and lettuce and tomato with mayo on wheat bread sandwich. Thanks for the contest.